Ten-year-old Charlie Whitfield, Year 5 pupil at Begbrook Academy, recently competed in the Western Area Regional Schools Judo Championship 2017. Having won Gold in 2016, Charlie was once again determined to stand at the top of the podium this year. Charlie won her three contests with eye-catching spectacular finishes to once again take home the Gold. 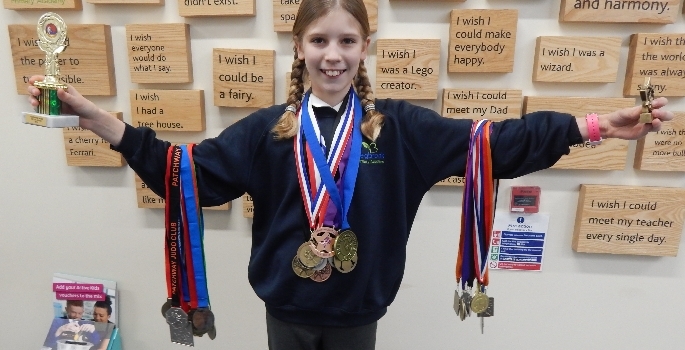 Despite winning the Gold medal within her combined year group of Year 4 and 5, Charlie is not eligible for the British Schools Championships 2017. This is due to the fact that the minimum entry for the British Schools Championships is for children in Year 6 and above. Charlie’s dad, who is also one of Charlie’s coaches, introduced Charlie to Judo at the age of six, so Charlie has only been competing for four years. Charlie, who competes for the Bradley Stoke Judo Club, will later this year be competing in and around Europe including The Netherlands, Bosnia, Croatia and Portugal. Among many of Charlie’s triumphs Charlie recently took Silver in The Hague, Holland at the IRJT Adidas Championship in November 2016.